Unlike previous summers, this has been mostly a quiet one, with recuperation from the semester (and a bit of surgery), and preparation for what looks to be a very busy fall. Here are a few photos from the last few months. This past weekend, Hurricane Harvey struck the Texas Gulf Coast, becoming the first cyclone to make US landfall since 2005, and has left almost undefinably horrific destruction in its wake. 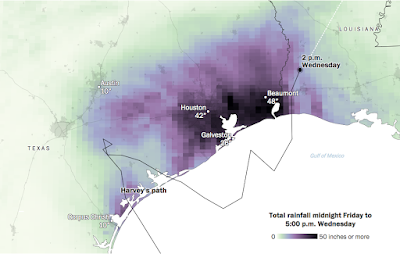 Over the last six days, the initially Category 4 hurricane and subsequent rainfall have drenched the coast and the Houston metro area with over 50 inches of rain, requiring 13,000 rescues (and counting); obliterating the coastal city of Rockport, where it touched down; flooding roadways large and small; displacing many thousands of people, and crippling a metro area of over 6 million people; and causing at current count roughly more than two dozen deaths. Though the storm is tracking eastward, potentially causing flooding and displacement in Louisiana, rain continues to fall both in the city of Houston and its environs, rivers, lakes, bayous, reservoirs and dams are at capacity, and highways, streets, and entire neighborhoods remain underwater. A great deal of Houston's critical infrastructure is either under threat or damaged as well. 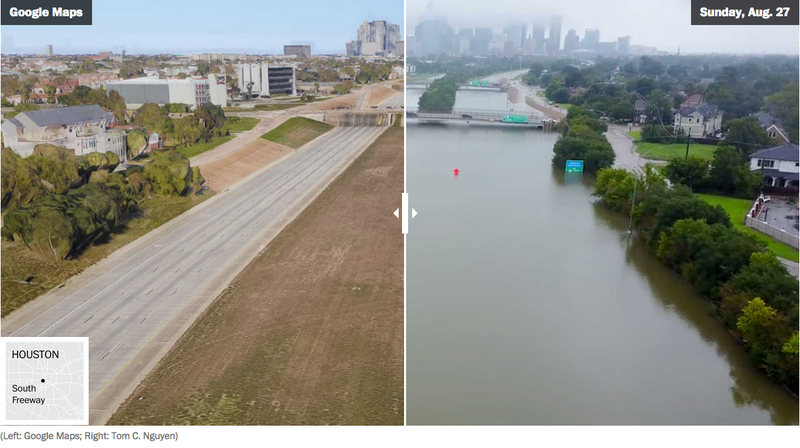 It is the worst recorded flood in Texas history, and recovery will likely take many years. My thoughts and prayers are with everyone there and their family members across the country and globe. The few people I know living in Houston are thankfully all out of direct harm's way, but have no idea when they will be able to return to their homes. Both in the near term and the long term, residents of the affected areas are going to need support, from the government and everyone else. In particular, children, the elderly, those who are ill, homeless people, and people with disabilities, to name just a few, will require sustained help. Below are links from reputable news sites with links on how to donate money, blood, food, clothing, funds for clean-up and rebuilding, and more. All Houstonians and residents of the Gulf Coast and states to the east, where rain is currently drenching cities and towns, will need our support. Please scroll through the various agencies, and if you can give something, please do, now and, if possible, down the road. "Here's How You Can Help People Affected by Harvey"
"Here's How to Help the Victims of Hurricane Harvey"
"How to Donate and Other Aid to Communities of Color in Houston"
"Making Sure Your Help Gets to Hurricane Victims"
"Here's how you can help the victims of Hurricane Harvey"
"Hurricane Harvey Disaster Relief: How to Help"
"Helping Out After Hurricane Harvey: Where, When & How to Donate"